So, right now I am in gelatin up to my elbows. Mixing, stirring, molding and unmolding delicious and deliciously questionable gelatin recipes that you wonderful people sent to me for our gelatin contest. 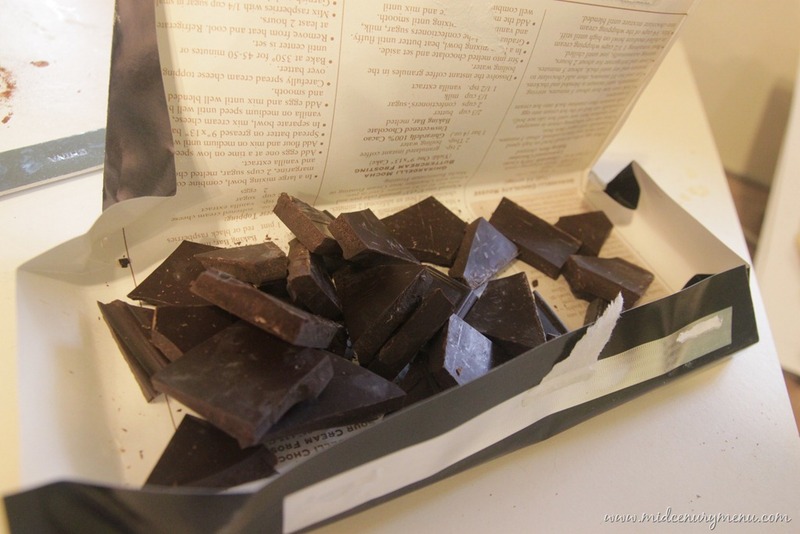 So, I decided to bring out something that was ultra-yummy and non-gelatin-filled to make up for the not-so-yummy things I have been making Tom eat lately. And so, I give you Chocolate Icing! I made this marvelous icing to go along with the Black Magic Chocolate Cake I posted about a few weeks ago. If you need a quick recap of the recipe here it is: Chocolate Cake + Condensed Tomato Soup = A Phenomenal Miracle. Seriously. And that cake miracle was made even more phenomenal by the really good chocolate icing recipe that I found along with the cake recipe. 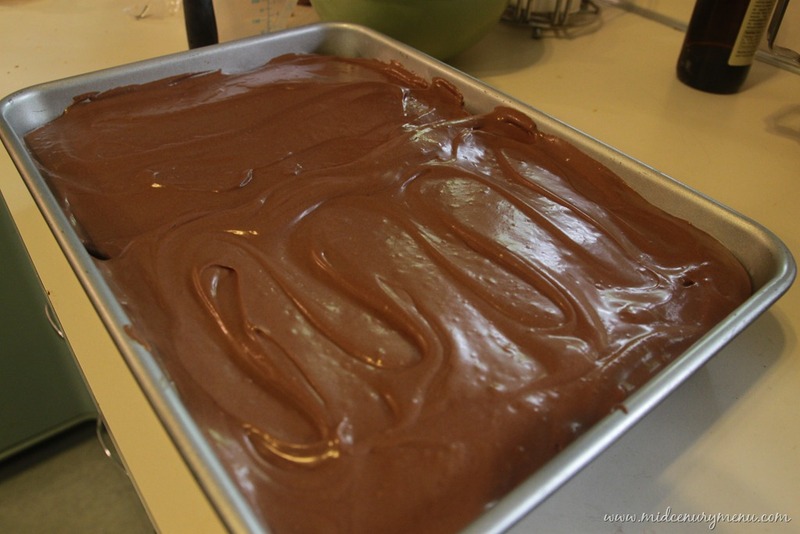 Now, like the Black Magic Cake, I made this icing several times. The first time I made it, it made a nice icing. And I mean icing. This was NOT a frosting. The icing had a lot of evaporated milk in it, which is fine, but it made the icing very runny and soft. This was something that you would pour onto a 13×9 cake not spread on a layer cake. My second try was a little better. I upped the amount of powdered sugar, which made it much more spreadable, but still not really a frosting, which I thought would be the best with the Black Magic cake. Here you can see the difference in the two icings. The one farthest back is the original recipe. The one closest is the recipe with extra sugar. The extra sugar worked, but it was still a little runny. Not quite what the cake needed. When I made the Black Magic Cake for the second time, I also gave the icing another go, and decided to take it more into the frosting realm. I added more butter, more sugar and reduced the amount of evaporated milk. I also did something I didn’t do with the other icings; let it chill in the fridge a bit and whipping it again before putting it on the cake. While this frosting wasn’t perfect, it was much more spreadable than the icing versions and just as chocolatey! And Tom, well, he loved all three versions. The Verdict: Yummy! Very good with a good, deep chocolate flavor. The original version is a traditional icing and is rather runny, so don’t expect to do any piping with it, but it was really good and even a bit bitter from the chocolate. 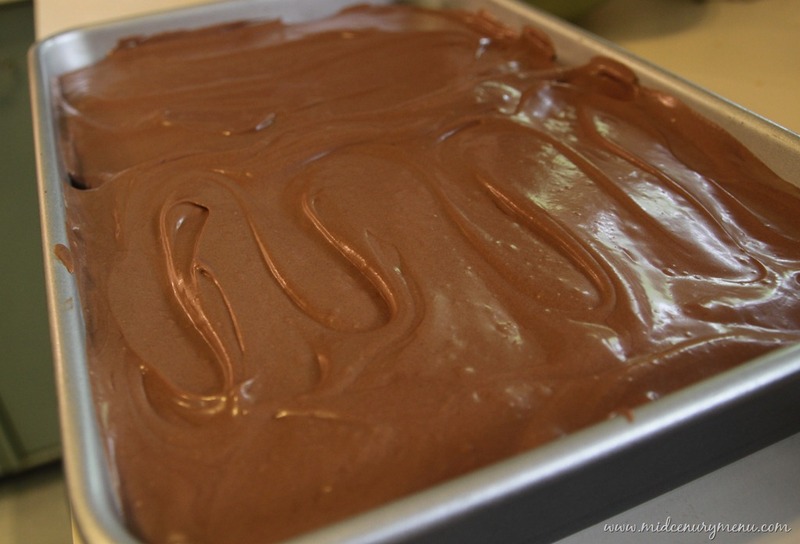 If you want a good chocolate icing, use this recipe! Add a little extra powdered sugar if you want something with more body, and if you want a nice, deeply chocolate frosting that you can spread on, follow my recipe below. 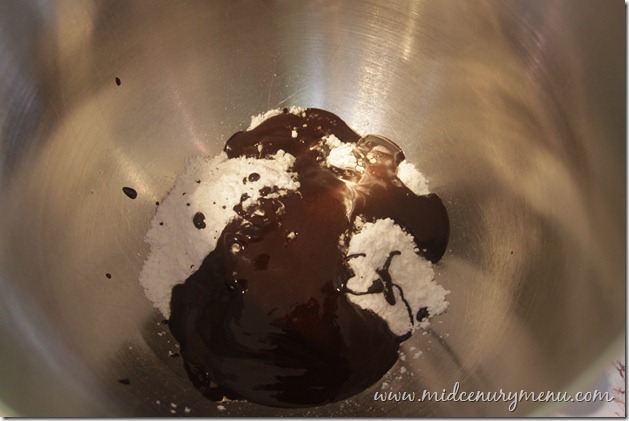 Melt the butter and chocolate together in the top of a double boiler. Remove from heat and beat in the remaining ingredients. Refrigerate for two hours or until chilled but not hard. Beat with rotary egg beater (or mixer) until frosting is the consistency you desire. I couldn’t decide the second time, so I picked both!! Just to let you know, though, the Vintage Bakery frosting recipe made enough just for the outside of the layer cake and the chocolate frosting recipe made enough just for the filling, so if you go with just one of the recipes I would double it for filling and frosting a layer cake! 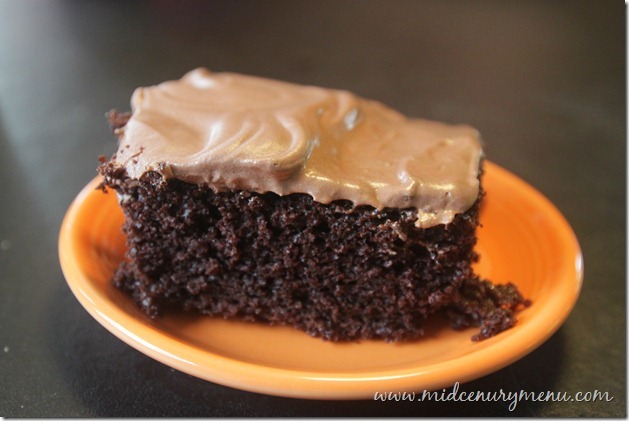 I have made the Black Magic cake twice now, and my family of six has DEVOURED it! I used the vintage bakery frosting. thanks for this, cause my hubby will not eat ‘white’ frosting. “It’s gross”. *shrugs*…he also will not eat meat with a bone in it. Like there are boneless chickens and cows out there making his meat?!?! I just go with it…LOL. thanks for sharing. Hooray! I am so glad they like it, Lorie! 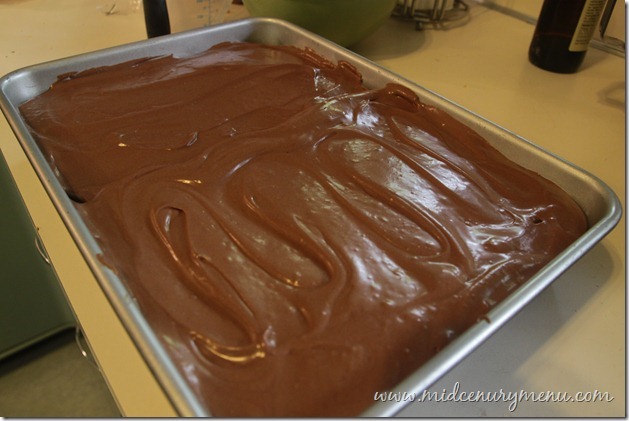 It is super, super good and easy to make, which is always a plus in my book. White frosting is “gross” huh? Well, not that shocking to me. 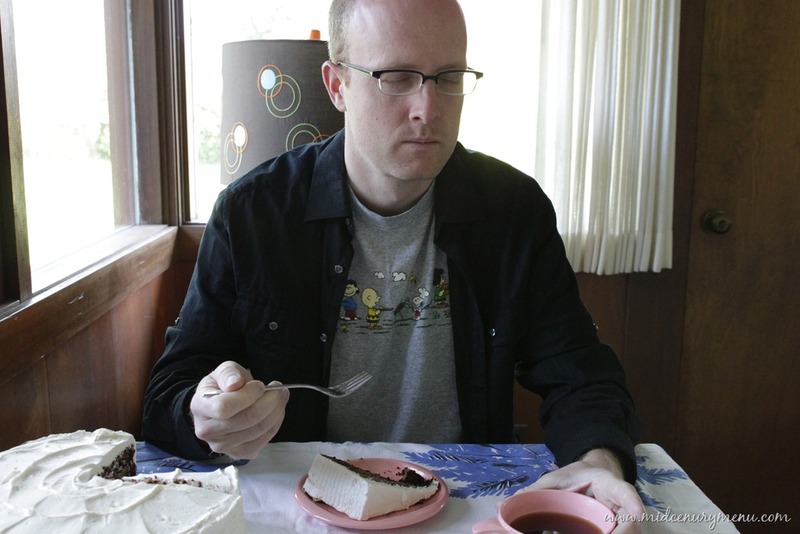 Tom is like that with cake. He is brave on the MCMenu, but he doesn’t eat cake from a mix or from grocery stores because he hates them, he only eats homemade cake! OK I guess I’ll have to try the Black Magic Chocolate Cake. I love The Vintage Bakery Frosting which I used on my Lambie cake (I used Almond extract instead of vanilla.) Now I can’t wait to try the Chocolate Icing. 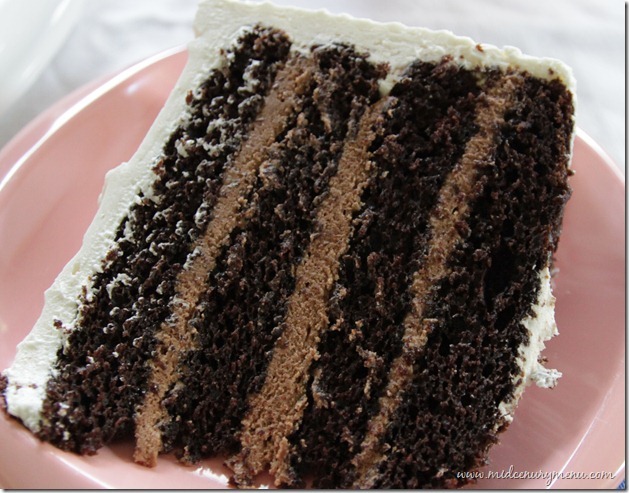 I would like to have the Black Magic Chocolate Cake recipe…if you don’t mind.. Sounds good..